We’re winding down the week, but there’s no slowing down! Today was full of new adventures and fun memories. Yesterday, the CrossRoaders had their last day of Theology classes, which included some time for Q&A with the professors. A big heartfelt thank you to Fr. Simeon and Dr. Legaspi for such engaging and enlightening lectures! The participants gained a greater understanding of the depth of their Orthodox faith. Following the lectures, the participants had an opportunity to participate in a variety of activities during structured free time. In the music room, the participants sang along while staff member Adam played guitar and also had the option to play the piano. We have very talented musicians in this group! We ended the evening by visiting St. Nicholas Albanian Orthodox Church. Fr. Konstandin was honored to welcome our group to their parish and we participated in a beautiful Vespers service together. Members from their community joined us to share the story of their Miracle Icon which has streamed myrrh on three separate occasions. It was truly humbling to listen to the miracles that occurred and to be able to see the icon itself. Upon returning to campus, we were greeted by a very special guest! Metropolitan Nathanael of Chicago visited the CrossRoaders and spoke to them about how special and important it is that they are investing in their faith. “That is the beauty of our faith. 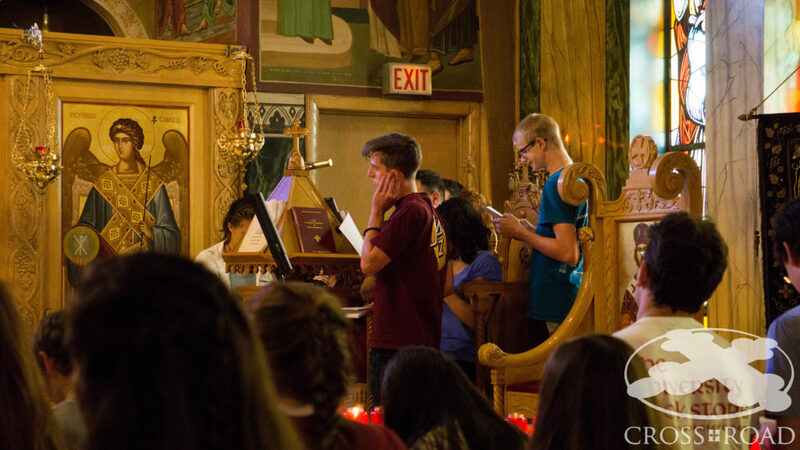 That love is never exhausted.” Thank you, Metropolitan, for inspiring our Orthodox youth! The participants were again given the chance to journal and reflect on all they learned during Stage 2, “Vocation and Christ”. Many of the CrossRoaders got up in front of their peers and shared. We closed the night by preparing for Stage 3, “Vocation and Christ in the Face of the Other”. They were challenged to answer the question, “who is my neighbor” and explored what it means to serve our neighbor. All the participants are off to sleep, as silence fills the campgrounds. Looking forward to growing in our friendships and faith yet again tomorrow!